« Bunyas, Kauris and those pesky flowering plants. Queensland Museum entomologists were in the Far North again recently to help more students and community groups understand what goes on in their back yard. The Backyard Explorer program guides participants through a relevant, locally-focused field activity to learn about ecology. It is a great tool for community groups and individuals to use insect biodiversity as a baseline from which to monitor the impact of their project over time in a scientifically rigorous way. On their latest trip, Dr Christine Lambkin and Noel Starick worked with students at Wonga Beach State School to complete a Backyard Explorer biodiversity assessment of the school’s revegetation work. Helped by their teacher Rick Weimar and the Wet Tropics Regional Landcare Facilitator, they compared the abundance and richness of invertebrates in their rehabilitated wetlands (173 specimens in 12 Orders) with the rainforest garden revegetation site (203 specimens in 11 Orders). While the Backyard Explorer team has worked with many schools and community groups across Queensland, this was the first time they had run full day program including collection, identification, collation and analysis, carried out by primary school students. Photos: Noel Starick, Queensland Museum. Chris and Noel also helped out at the Cardwell Bioblitz, a 24-hour community biodiversity study organised by Terrain Natural Resource Management to raise awareness of the fragile state of the mahogany glider in broad- leaf tea tree habitat. The event attracted over 60 participants who surveyed and recorded nine micro-bat species, 29 bird species, 342 insects in 14 orders and 100 plant species under the expert direction of ecologists, scientists, knowledgeable volunteers and Terrain staff. 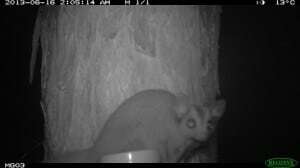 To cap it off, two mahogany gliders were also captured on IR camera.